The above cartoon was published on September 20th 2010 in Ottawa's daily newspaper Le Droit and was carried as well by Cyberpresse, the website that hosts all the articles of the Gesca newspaper chain. MONTREAL, September 20, 2010 - B’nai Brith Canada - Quebec Region is shocked by the cartoon which appeared in the September 20, 2010 edition of La Presse. 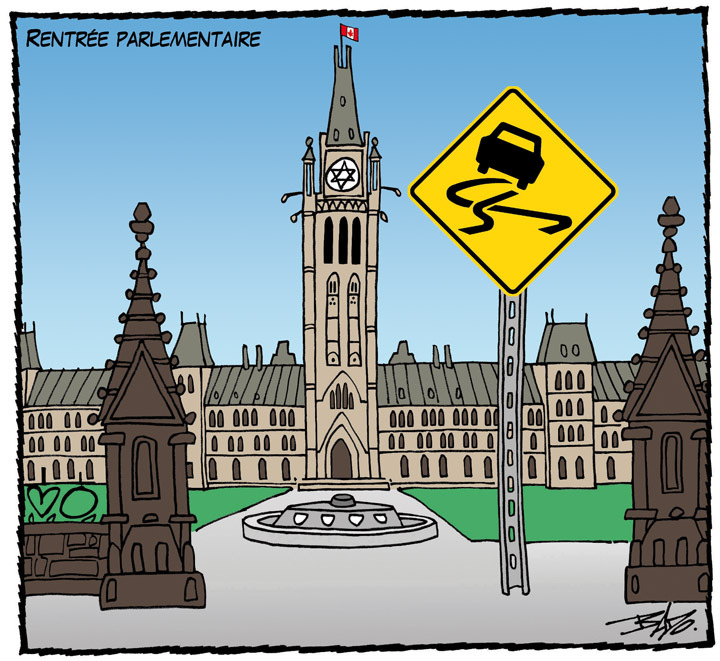 The outrageous cartoon depicting Parliament dominated by a Star of David insinuates the false and offensive allegation that Jews control the Government of Canada. “The caricature plays into vicious and baseless age-old stereotypes of a Jewish conspiracy of control, said Me Moïse Moghrabi, Quebec Chair of The League for Human Rights. “This cartoon does not comment on any issue of significance, it simply serves to raise public resentment against the Jewish community. We find it regrettable and shameful that a respectable newspaper would promote such harmful canards. This cartoon is an attack on the Jewish community in Canada. “This is not the first time that La Presse has published a cartoon laced with anti-Jewish connotations. In June 2007, Serge Chapleau depicted the Action Démocratique du Québec leader in a negative light, as a stereotypical Hasidic Jew, with ear locks and an oversized black fur hat. TORONTO —The Canadian Jewish Congress has come to the defence of an Ottawa editorial cartoonist who Congress officials say was wrongfully targeted as anti-Semitic by B’nai Brith Canada. In a Sept. 20 cartoon for Le Droit, a Gatineau-area publication owned by Cyberpresse – the parent company of Montreal’s La Presse newspaper – longtime political cartoonist Guy Badeaux, a.k.a. “Bado,” drew an image of Parliament Hill with the Peace Tower in the background and what appeared to be a Star of David in the centre of its clock face. 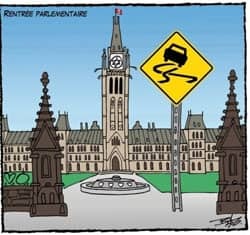 The French caption on the cartoon reads “Parliament returns,” and there’s a traffic sign on the lawn whose pictogram signifies a slippery road ahead. 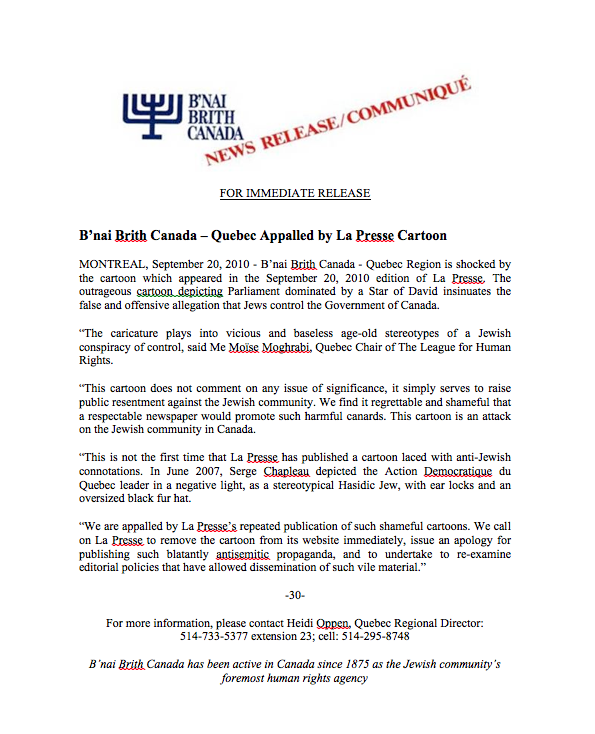 In a Sept. 21 statement, Moïse Moghrabi, chair of B’nai Brith Canada’s Quebec region of the League for Human Rights, called the drawing “vicious and baseless,” and based on “age-old stereotypes of a Jewish conspiracy of control” of government. 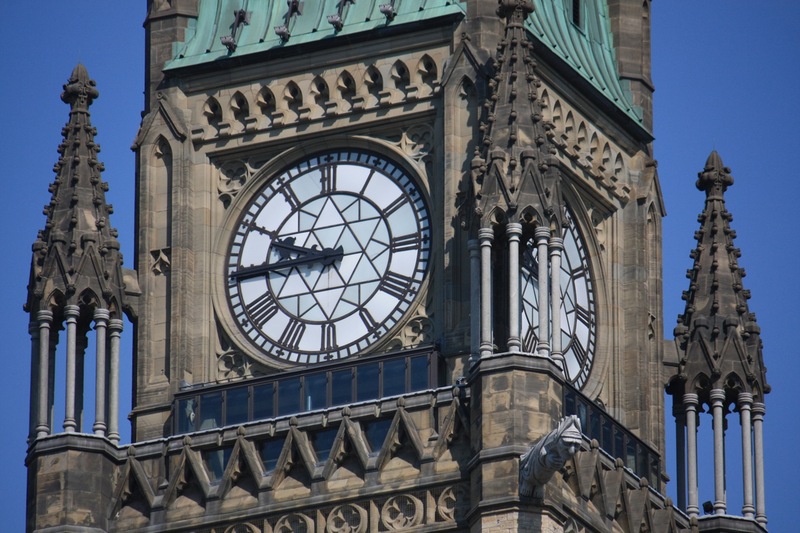 Speaking to CBC News, Badeaux said he never meant to draw a Star of David, but rather was trying to draw a simplified version of the design on the Peace Tower’s clock face. A Quebec Jewish Congress official also came to the defence of Badeaux, whom he said he has known for a long time and considers a friend of the Jewish community. Daniel Amar, QJC’s regional executive director, said he spoke to Badeaux last week and accepted his explanation that the six-pointed star he drew is a stylized sketch of the actual pattern on the clock face. Amar noted that last year, Badeaux participated in a panel at in an international exhibition in Montreal, called Cartooning for Peace, that was conceived by French cartoonist Jean Plantu and Israeli cartoonist Michel Kichka, and co-organized by QJC and the Action Week Against Racism. Amar said Badeaux had communicated that he was very upset at being falsely labelled anti-Semitic. “Who wouldn’t be upset? The cartoon description [by B’nai Brith] is pretty harsh. But Badeaux is relieved that we’re standing up for him as a friend,” Amar said. Despite both Badeaux’s and Congress’ claims that the cartoon was innocuous, a Sept. 22 statement by B’nai Brith re-iterated the organization’s belief that it was aimed at the Jewish community. “The artist’s claim that he was merely ‘attempting to draw the design of the Peace Tower’ is not acceptable. It is his responsibility and the responsibility of the Cyberpresse group to pull the cartoon and issue an apology. The cartoon is offensive has no place in a respectable newspaper such as La Presse,” Moghrabi said. When asked if B’nai Brith had researched Badeaux’s history and association with the Jewish community before making its charge, Heidi Oppen, the organization’s Quebec regional director, told The CJN that B’nai Brith had not contacted Badeaux, but that it’s aware of his background and Congress’ stance. Regardless, she said her organization wants Badeaux to issue an apology for his “unacceptable” drawing. Even by the time Annie Hall came out (1977), such paranoia was more a joke than a reality in North America. These days, it is ancient history. Yet here in Canada, there is an obsolete organization that persists in channeling the spirit of Alvy Singer in its paranoid press releases. And sadly, its leaders aren’t in on the joke. I’m speaking, of course, about B’nai Brith, the organization whose leadership believes that excluding female ski jumpers from the Winter Olympics can be spoken of in the same breath as the policies of Nazi Germany. This week, the organization targeted a Quebec editorial cartoonist whose depiction of the Peace Tower clock in Ottawa allegedly was festooned with a Star of David. Or maybe, Frank … it’s just a star! Or, more specifically, it’s a star meant to depict the somewhat similar, but more complex, star shape that sits on the face of the Peace Tower clock — just as the artist claims. And who is this artist? Maybe Frank should have checked before he accused him of putting a cartoon rendition of the Protocols of the Elders of Zion in the pages of Le Droit. Turns out his name is Guy Badeaux (aka “Bado”). And he’s not exactly a follower of Mahmoud Ahmadinejad. In fact, he’s a personal friend of the Canadian Jewish Congress’ Quebec Regional Director. At the request of Israeli cartoonist Michel Kichka, Badeaux also appeared at an event called Cartooning for Peace, which took place at a Montreal synagogue. At no time during the event did anyone remember Badeaux alleging that our country is run by a Zionist Occupation Government. If this absurd allegation against Badeaux were an isolated event, we could laugh it off. But as I’ve noted before, hysterically exaggerated claims of anti-Semitism have become a habit at B’nai Brith. And it’s becoming an embarrassment for everyone concerned, including the Jewish community itself. With the exception of hard-core Islamists and their radicalized left-wing fellow-travelers, Canada is a society virtually bereft of real anti-Semitism. It’s something we should all appreciate — instead of going off on peevish treasure hunts for secret messages in editorial cartoons. My cartoons in "Portfoolio 22"
My cartoons in "Portfoolio 21"
My cartoons in "Portfoolio 20"
My cartoons in "Portfoolio 19"
A brief history of "Portfoolio"